This report period affects the data displayed on the Keyword panel, Campaign Summary panel, AdGroup Summary panel and Ad Creative Summary panel. there are 2 ways to change the "Report Period"
1. Click the "Report Period" icon on the Toolbar. 2. By going to "File Menu" and "Edit Account". Change the tab to "Scheduler". How to Customize the "Report Column" ? How to Apply Margin/Mark Up to the Performance Report ? How do I customize the keyword report with my company detail? 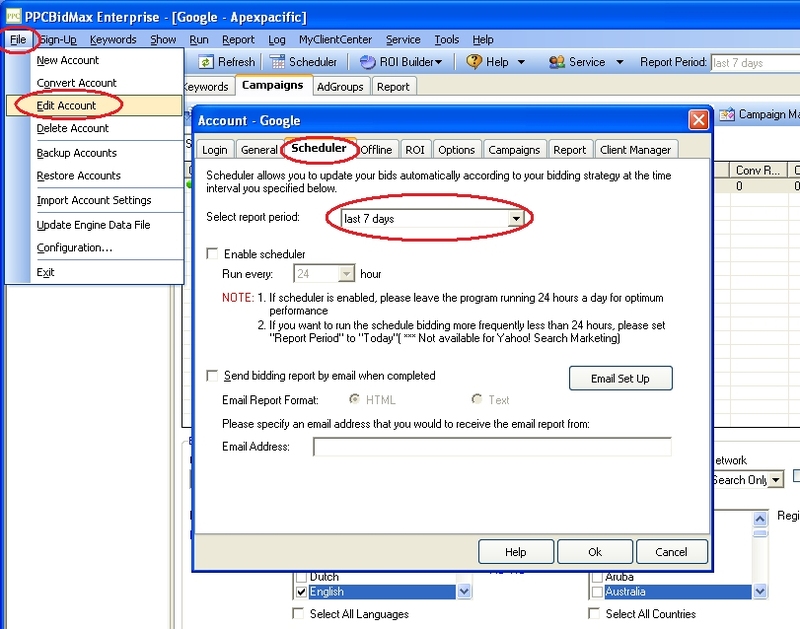 How many report types does PPC BidMax have? How do I change the "Report Period" for the statistical Data on Keyword/Campaig/AdGroup ? How Do I Schedule the Performance Report ? After loading my MSN Adcenter account into Bid Max, my account data (clicks, impressions etc) is different that MSN Adcenter web interface. Why is that?